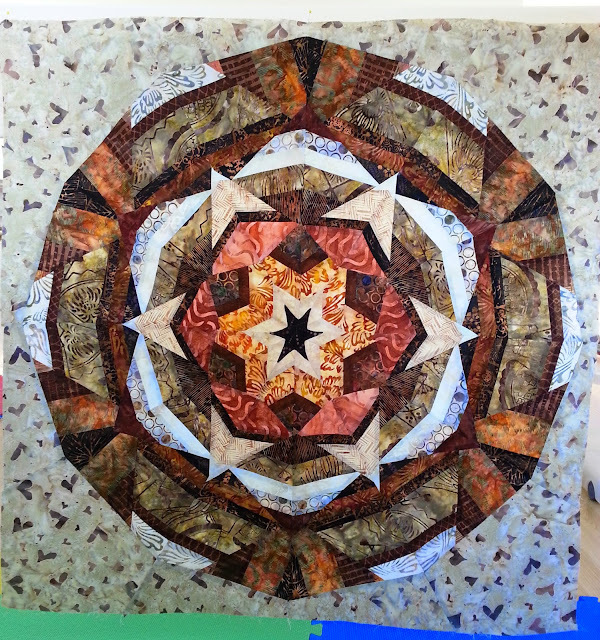 My client is not in love with her kaleidoscope (I know!!! Can you believe it??? ), so didn't want me to spend too much time quilting it. Time for some "quick and dirty" custom work. Well, quick, anyway! My plan was to divide and conquer. 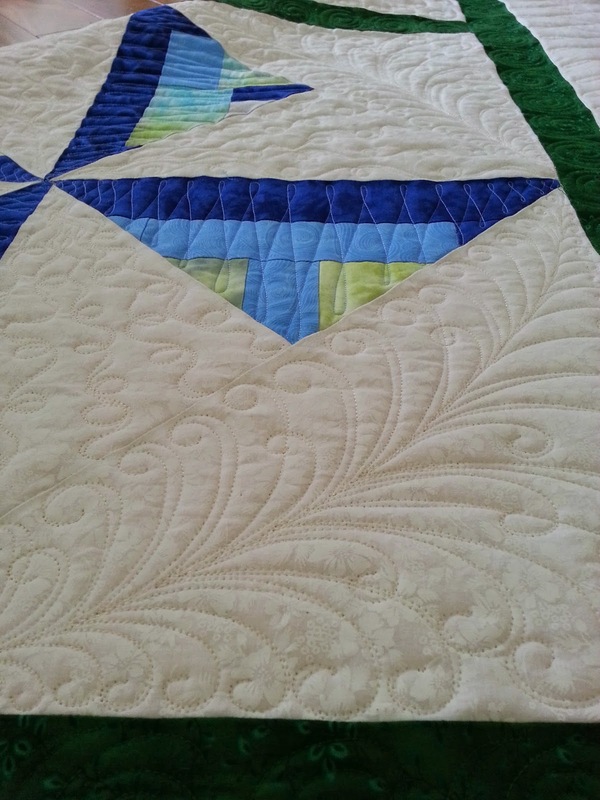 Looking at the quilt from a distance I could see sections of piecing that looked like distinct shapes waiting to be filled. I started with the center star, working a curvy feather out to each tip. 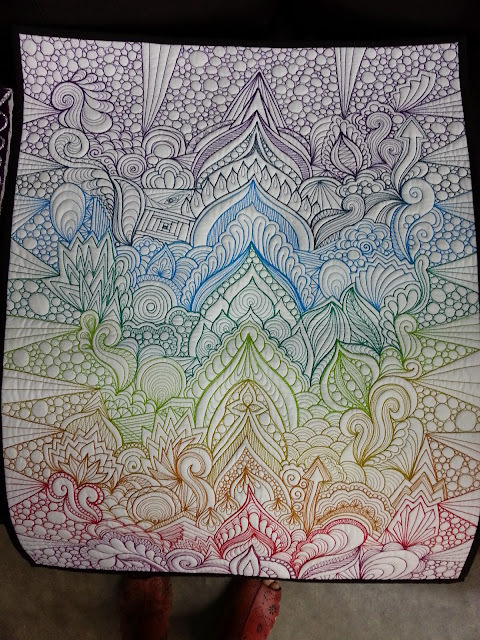 The next two sections were filled with lines - one with mirrored curves, and one with radiating straight lines. The last section was filled with giant paisley petals and little curly swirls to reach the corners. Of course, each of these was repeated five more times, all around the kaleido. Finally, radiating wavy lines finished the corners. 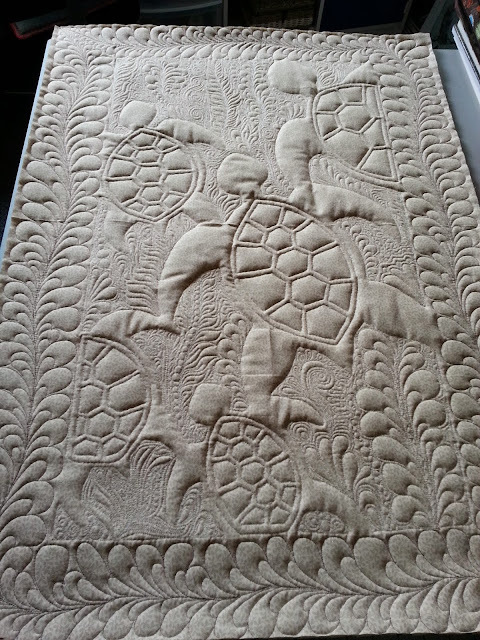 Despite running over a million seams, the quilting was fairly smooth once I got a feel for it. I did rip out the first attempt at feathers and try again. Better. thread would contrast strongly on some fabrics - eek!!! It is much more forgiving to work with thread that blends! It was truly challenging to loosen up my usual "quilting to death" style. And, if I'd had time in the budget, you can bet there would have been feathers in those corners! I did get all of my bedding plants out, but the veggie garden has yet to be seeded. Tomorrow, or bust!!! If I don't get it done by then, there won't be much point. 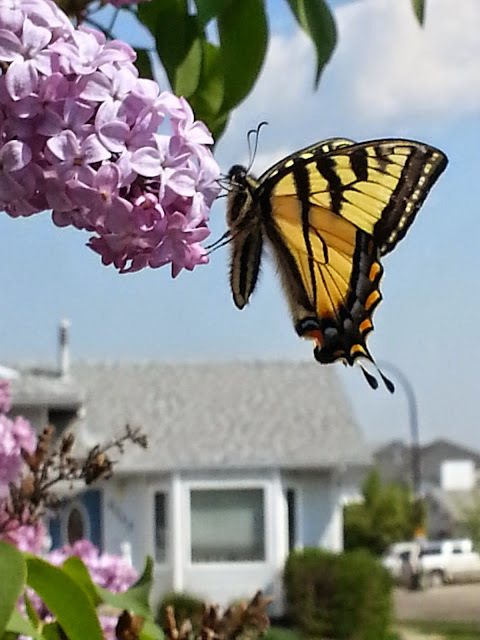 While I was working beside my lilac bush, a little visitor stopped by. My phone was handy, so I took a few quick shots. This was my favourite! Oh, and my potato plants are starting to poke out of the soil! Believe it or not, it's my first time growing potatoes! I've always thought they take more space than they're worth, but we ripped out the raspberry patch (which was out of control) and I figured I might as well weed potatoes as an empty bed. Now I'm looking forward to a feast of fresh spuds in the fall! Linking up with some fun parties - please check out my sidebar to see where they are. There's something fun for every day of the week! P.S. I love hearing from you, so don't be shy. 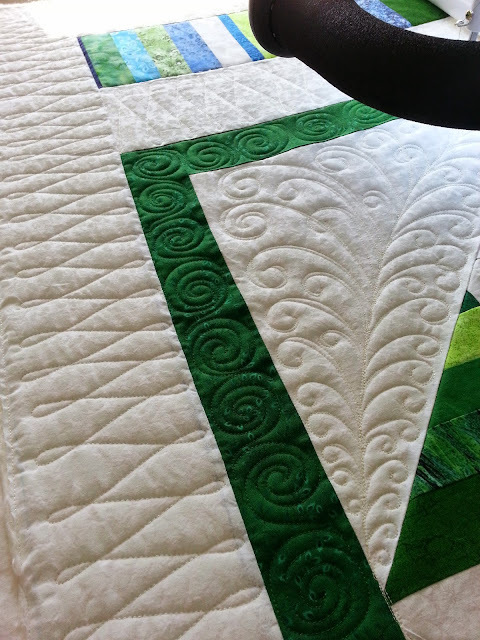 Tell me about your quilting challenges, or how your garden grows! Well, a finish for me, anyway! 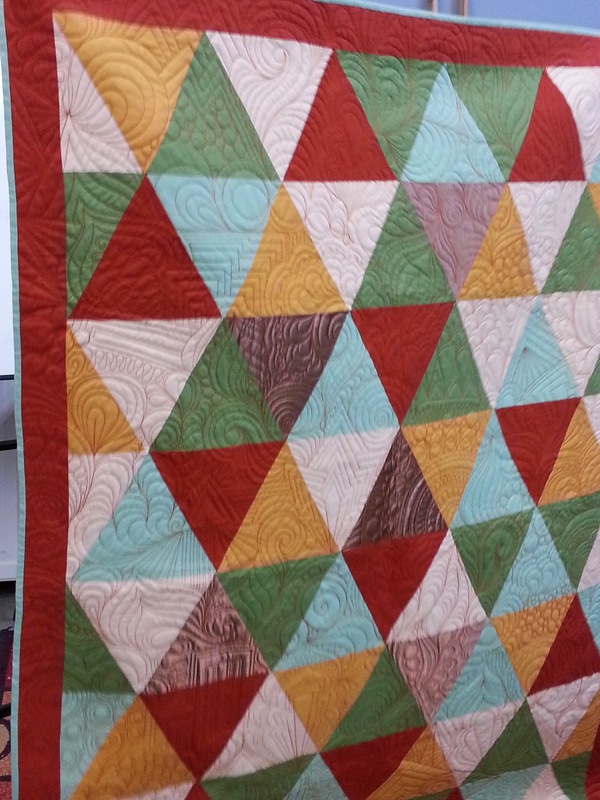 My client still needs to add binding, but this baby is as good as done! This went straight out the door so I didn't have much time for pictures, so please forgive their hasty nature. I just couldn't bring myself to do "typical" water quilting, so decided the turtles should be swimming in seaweed instead! I decided the borders needed seaweed, too. There are two fronds, and both start in the bottom left corner, and meet in the top right, curving around the other corners as feathers would. The back looks pretty cool, too! Spring has sprung in a big way. 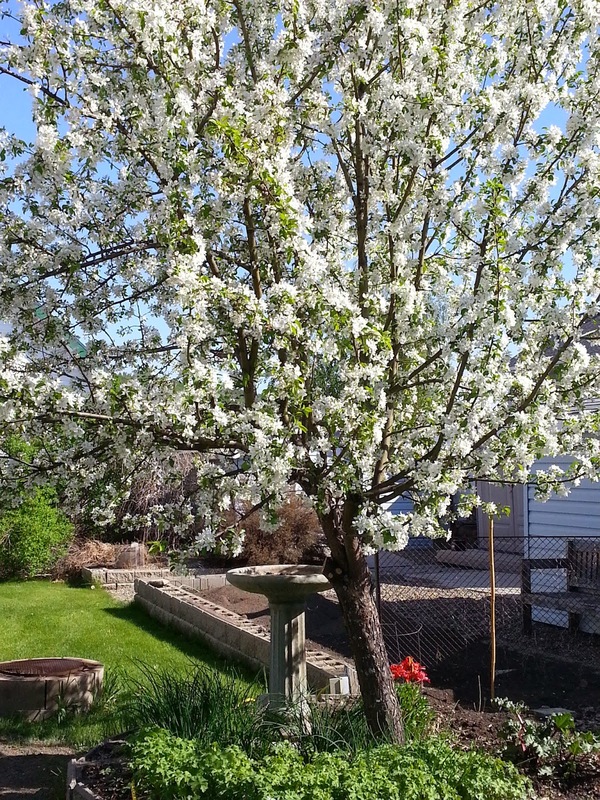 Our crabapple tree is loaded with blooms, abuzz with bees, and smells like heaven on earth! This weekend I hope to plant my little veggie patch and finish cleaning up my flowerbeds. I threw some potatoes in the ground last week sometime. I wonder how long it will take for them to sprout? It is supposed to reach 28 degrees Celsius tomorrow! Better break out the sunscreen so I don't fry. Linking up with a number of parties this week. Please check out my sidebar to see where the fun is today! P.S. I love hearing from you, so don't be shy. Please say hello! My boys were little when the Ninja Turtle movies first came out, so that just had to be said! Okay, so this top is amazing. 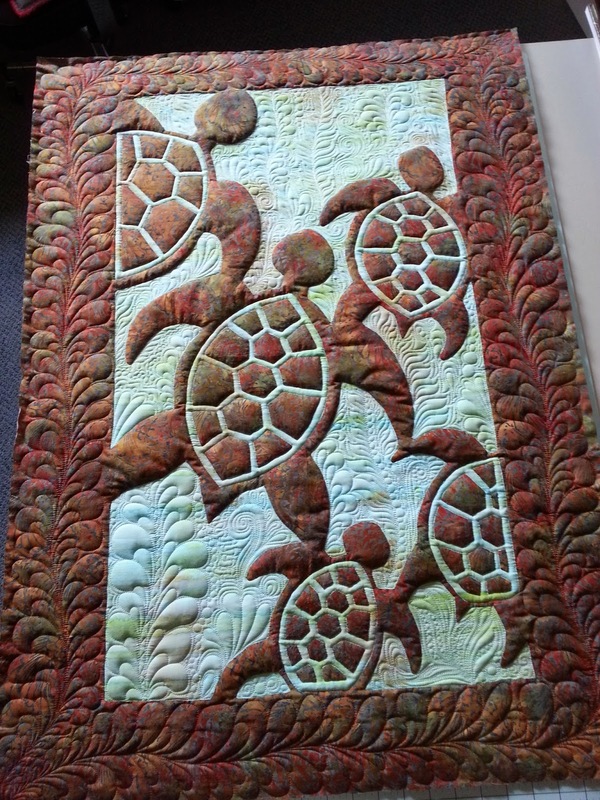 Notice how the border fabric also forms the turtle shapes. 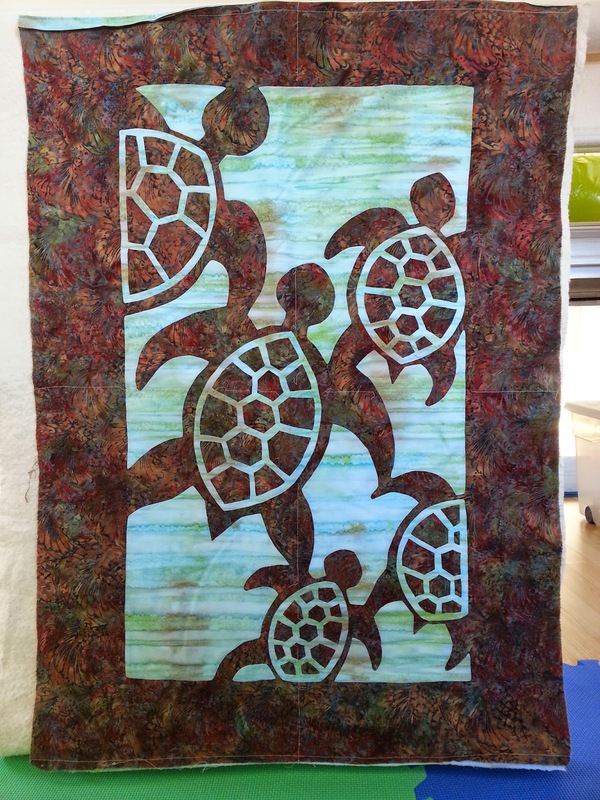 It is one piece of fabric cut out and appliqued onto a watery background. ONE piece!!! 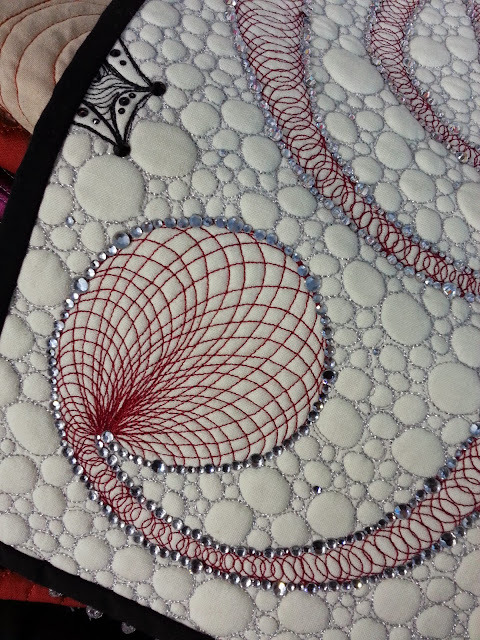 Not only that, it is all NEEDLE-TURNED, HAND APPLIQUE. 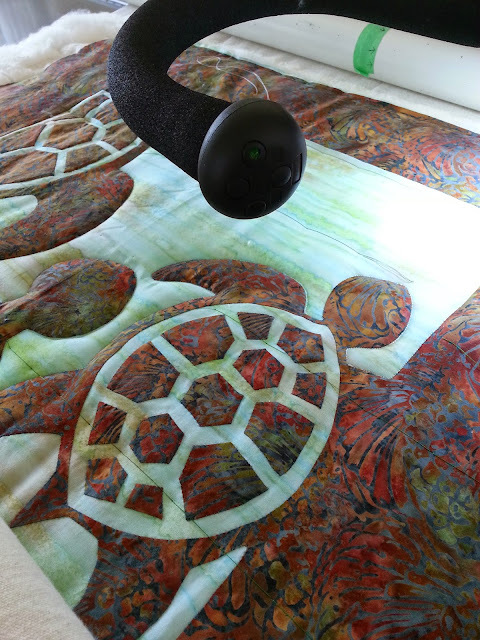 As are all the bits that define the turtles' shells. The first thing I did was remove the existing basting stitches. 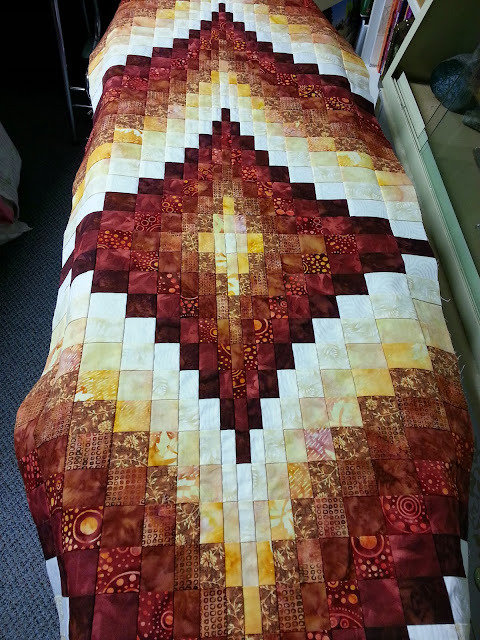 I then loaded and basted for machine quilting. 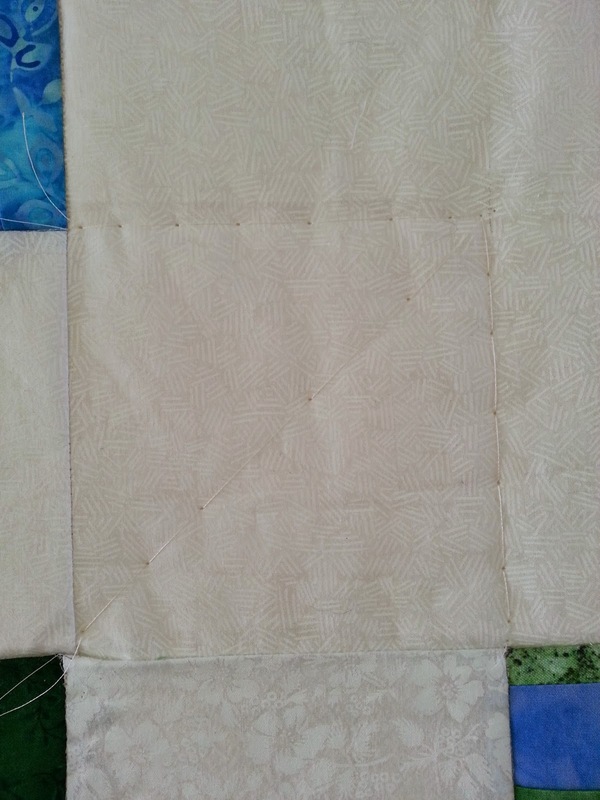 With two layers of batting (cotton topped with wool), I thought it wise to keep my basting lines close together to compensate for distortion caused by the extra loft. 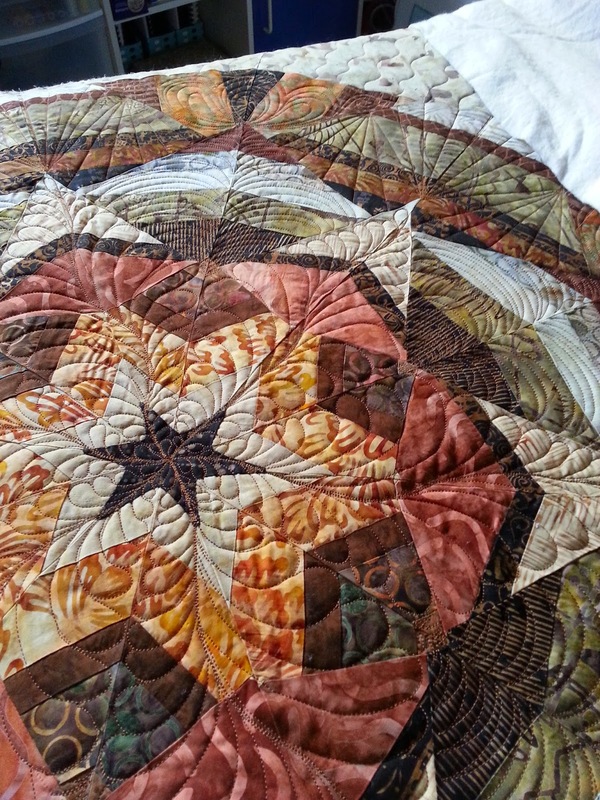 I used dark green basting thread so it would be easy to see. I removed my basting stitches as I worked my way down the quilt, outlining the applique. It was fun seeing the turtles puff up as I went along! 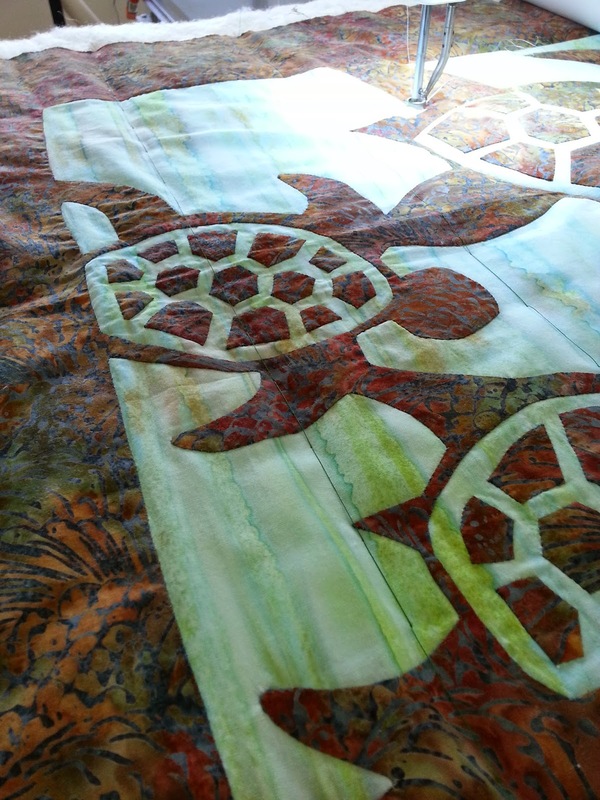 Here is the small turtle at the bottom edge of the quilt BEFORE outlining. And, here is the AFTER shot of the same little turtle. Quite a difference! 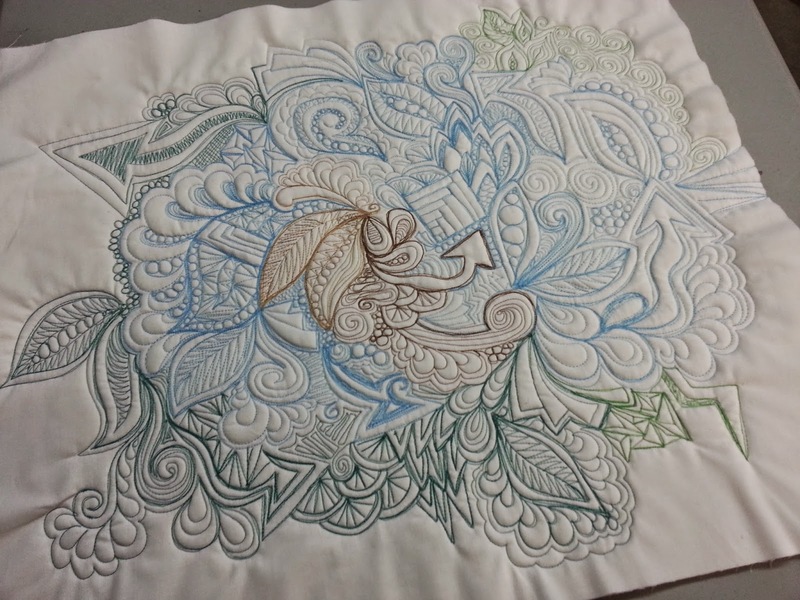 "After" the main applique shapes were outlined (not the small bits, yet). 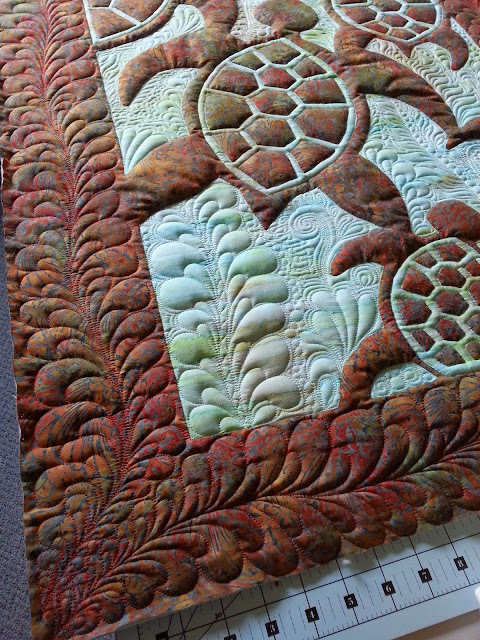 Once the quilt was anchored, I went back and stitched around each little bit of shell. Again, I love how the wool batting puffs up. Things look full, firm, and smooth. Nice!!! 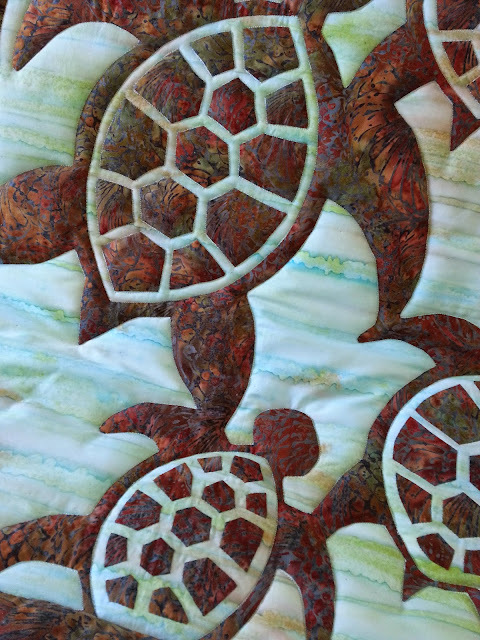 In the photo below, the bits in the large turtle shell are outlined, but the bits inside the two little ones underneath are not. 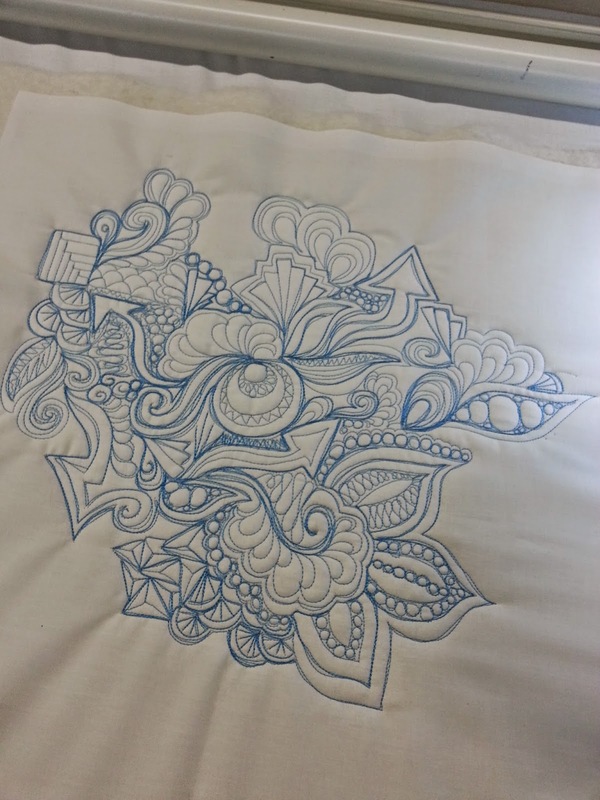 The outline stitching adds a lot of definition. Pretty cool! 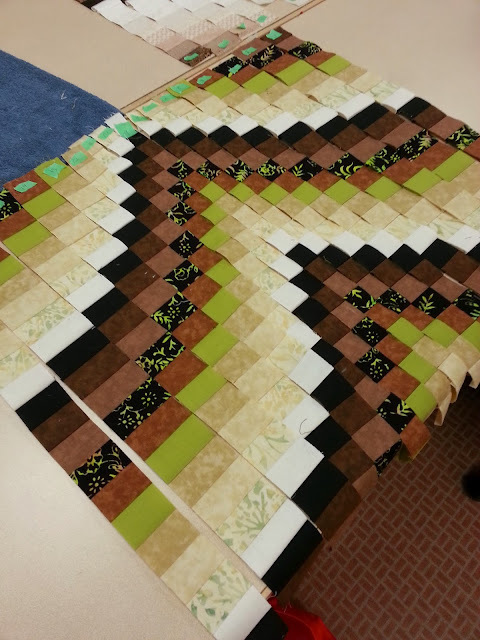 Now that the "structural" quilting is done, the rest is going to be fun! This morning I awoke with several ideas that are completely different from what I'd planned. I can't wait to see how this plays out! Everything has been turned in except my reading journal. I'm trying to compile my notes so they will make sense to an observer! The deadline is May 18th, so I'm working hard and steady to get this done. In February I bought a gym membership as my 50th birthday present from me, to me! My plan has been to walk for 30 minutes, three days a week with my Mom, and then hit the gym for an intense weightlifting routine. On Friday I completed my 32nd official workout! While that's not a big number (yet), it makes me feel good to have kept my commitment. Making myself a priority is a challenge some days, but I tell myself, "It's what I do." No negotiation. It's just what I do. Meeting my Mom for that walk is part of my strategy. Once I'm dressed for exercise and out the door, I might as well head to the gym, right? It's what I do. If I'm planning to be away I will hit the gym early on the day I leave and, as soon as I return, I'm there at the first opportunity. I know from experience that letting things slide even once would be doom, so I'm there! It's what I do. How do you set yourself up for success? P.S. I do love hearing from you, and hope you will forgive my "radio silence" lately! Once I have submitted everything for the JCP I will be able to spend time chatting and catching up with you, my lovely bloggy friends! P.P.S. 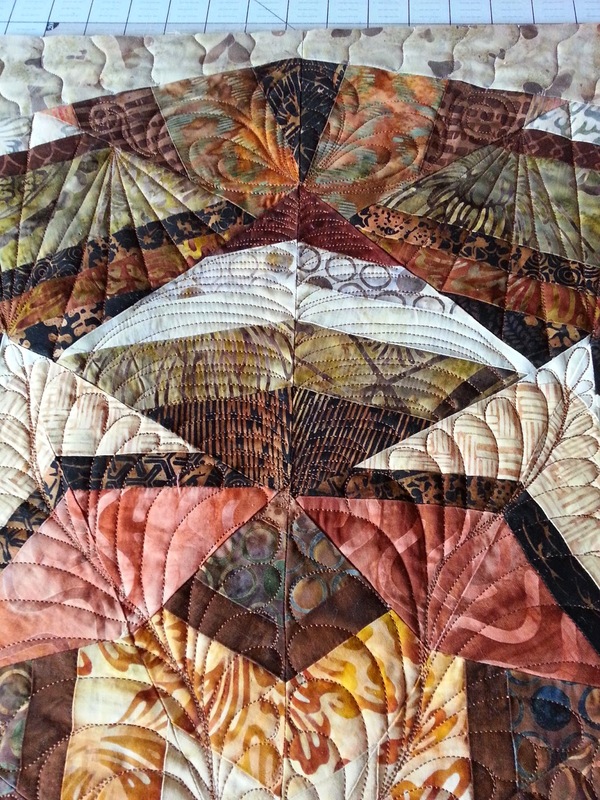 Check out my side bar for some great linky parties. There's something fun every day of the week! Karlee - aka the Graffiti Quilter - made the trip to Edmonton from Utah to teach a workshop. If you don't know her work, the link I've provided (above) will take you to her gallery. Here is one of my favourites. In person, it absolutely shimmers. It was made for a competition sponsored by Swarovski, so is loaded with crystals! I think the design is brilliant. It won first place in the contest, so I guess I'm not alone in that thinking! Shimmering Symphony, by Karlee Porter. Karlee is a generous teacher, allowing us to browse her personal journals & sketchbooks, take photos at will, and handle her quilts - even this one! Here is a detail of Shimmering Symphony. 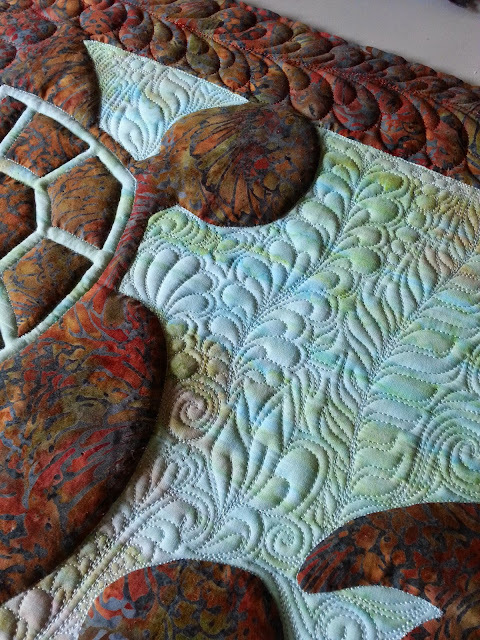 Detail, Shimmering Symphony by Karlee Porter. The next is obviously a professional photo. 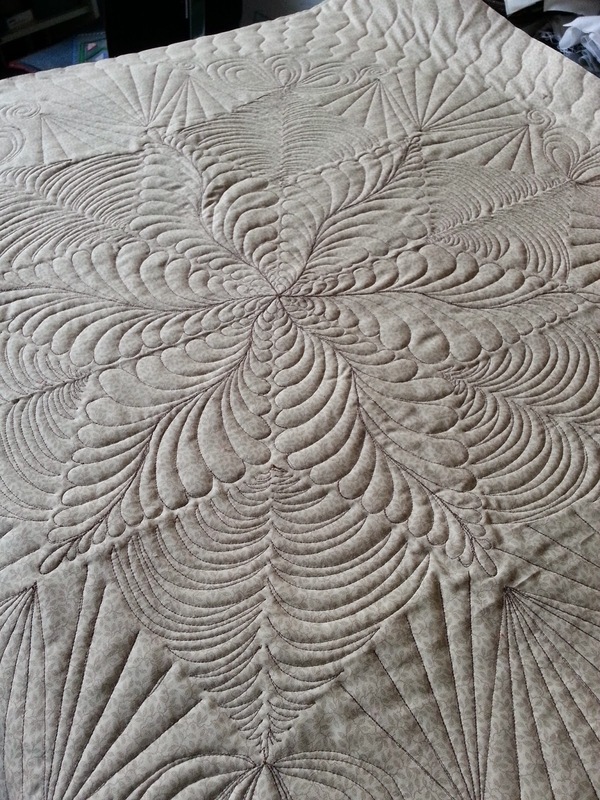 The quilt was draped over a sofa - my feet are just a bonus. Ha! 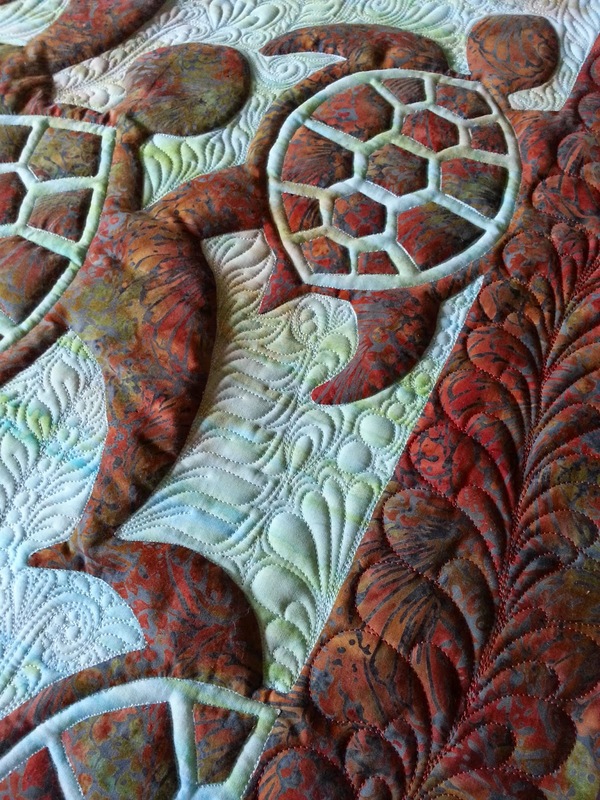 What a treat to be "up close and personal" with Karlee's quilts. After we drew for a few hours, we were sent to the machines to try out some designs. This (photo below) was my first attempt at stitching graffiti-style. Even though it's always a challenge to use unfamiliar equipment, I'm so glad that Sparrow Studioz offered a hands-on experience. Karlee's coaching was invaluable. 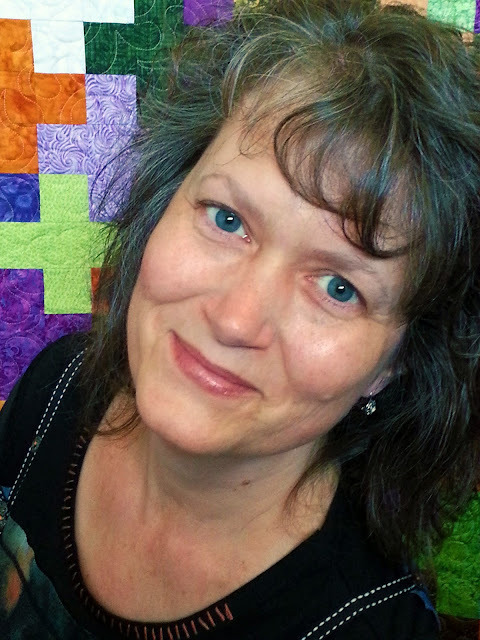 I shamelessly eavesdropped as she helped others in the room, and was able to ask for advice if I felt stuck. 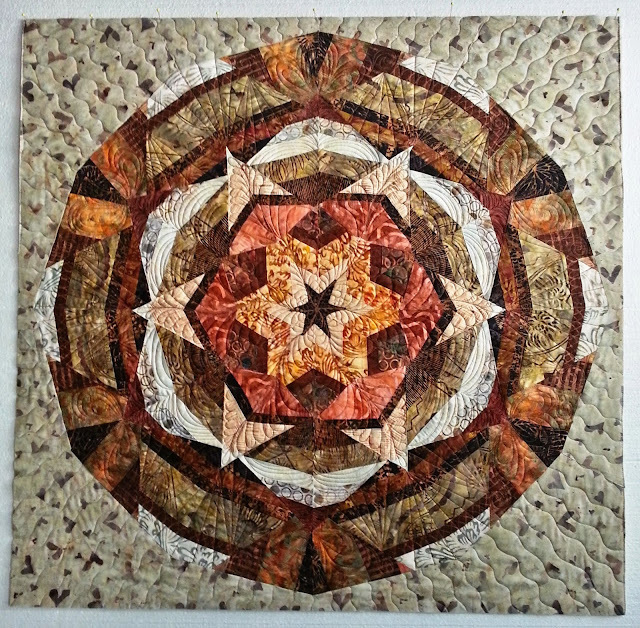 Here is the piece I did on day two . . . on another unfamiliar machine. This one hated me. Oh, well. The point was to learn - not to worry about perfection - and learn I did!!! People often question Karlee about the practicality of this kind of quilting. 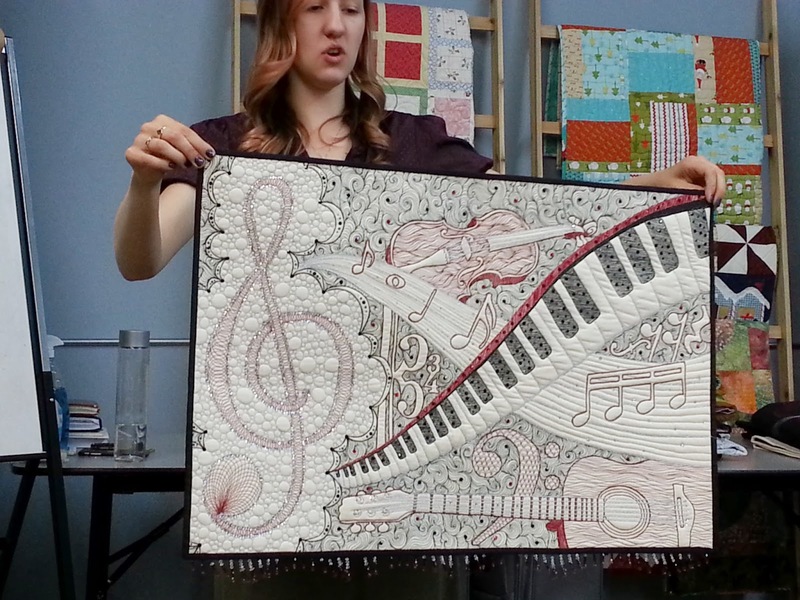 Can it be translated for use on a full-sized quilt? The answer is YES, very effectively! 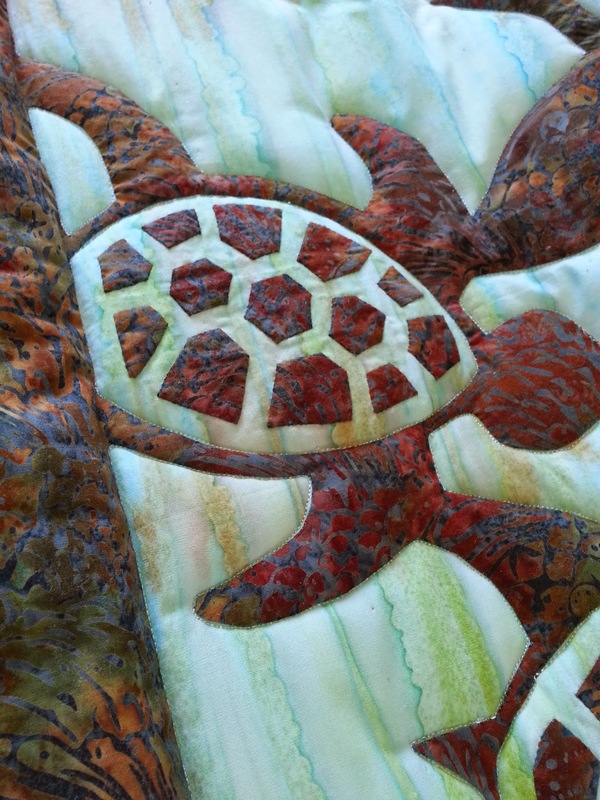 Here, you can see the stitching on the back of a larger quilt. It is scaled way up, and there is far less over-stitching, but the idea of "smashing" designs together, graffiti-style, is the same as before. 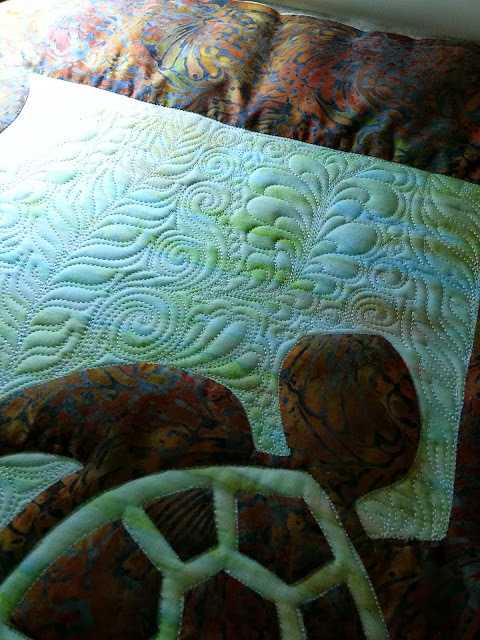 This is what the front of the quilt looks like - sorry for the blurriness, but Karlee moved just as I snapped. I didn't want to stop the trunk show and ask for a re-take! After a bit of practice, this will be an option my clients can choose! (So exciting!!!) I think it looks fantastic over simple piecing. 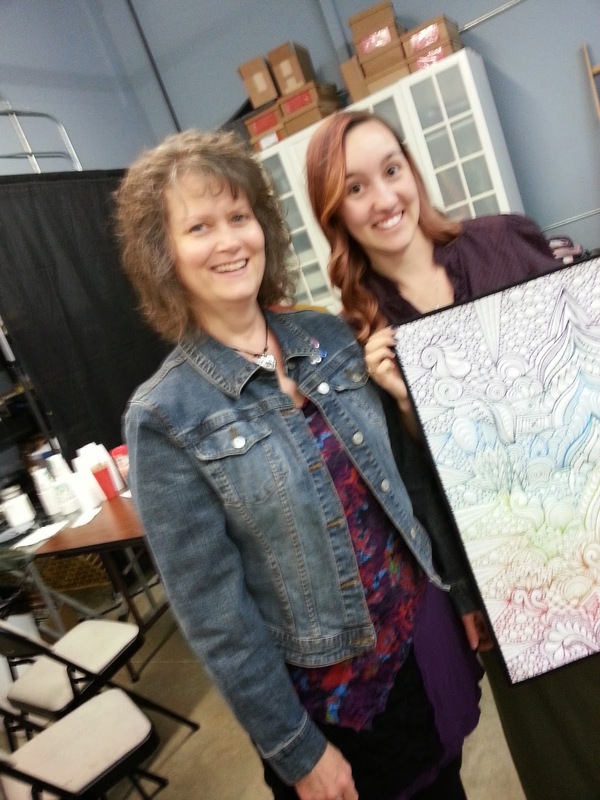 Thanks for a fabulous class, Karlee!!! Before heading out to become a student in Karlee's class, I spent a day being a teacher. I love experiencing both roles - especially in the same week! 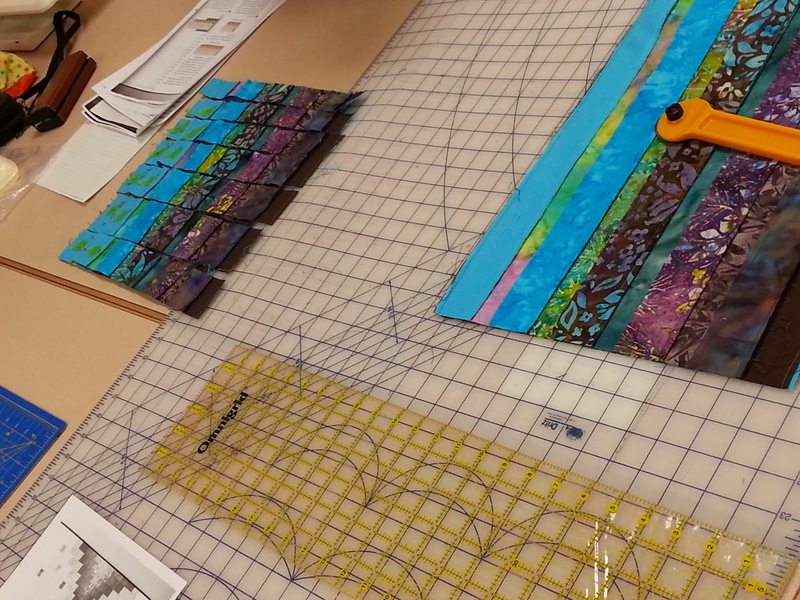 Starting with strips pieced before class began helped speed things along on workshop day. The ladies were able to dive right in, slicing and dicing . . . Organizing and labeling . . . 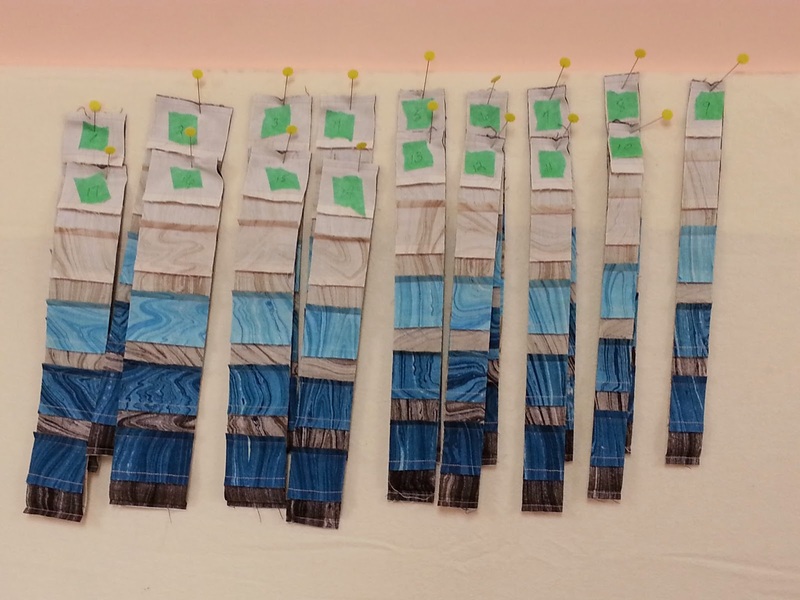 Laying out strips . . .
And sewing strips together . . .
By two p.m. several runners were at the halfway point, and by the end of the day the ladies were well on their way to finished tops! 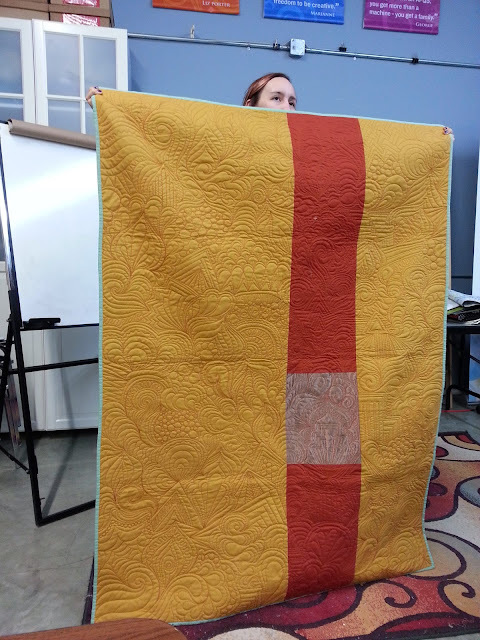 This is a sorry-looking photo of my class sample, but it gives an idea of the final design. With one thing and another, it had been a month since I hit the frame, so this finish felt particularly great! 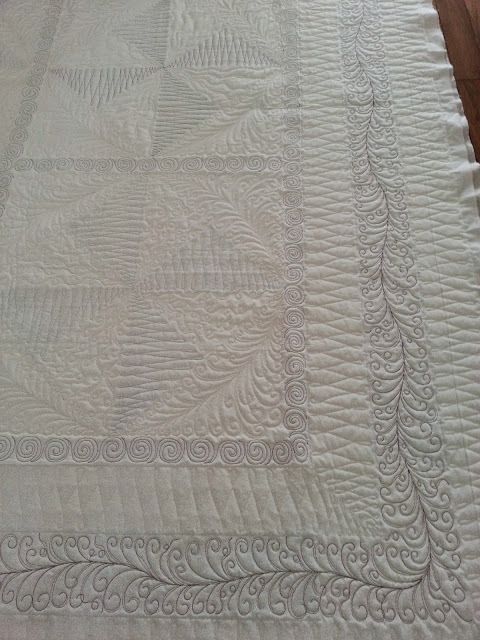 The quilt had been handed over to me with the comment, "Have fun!". 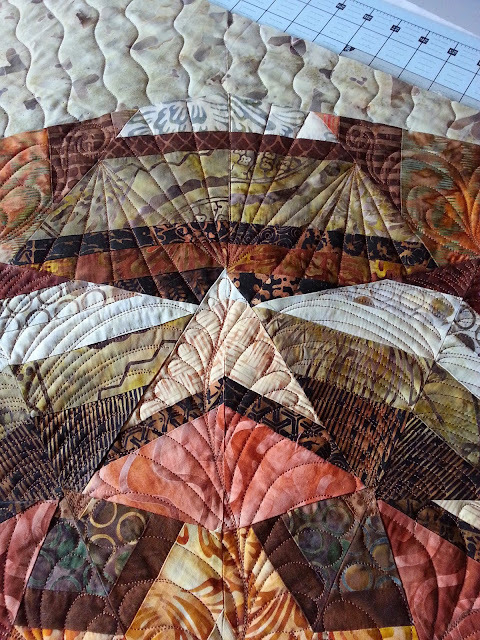 I experimented with the borders, running the quilting around the corners as though the piecing continued in the same way. I didn't want to mark the quilt for fear the marks wouldn't come out, so I used basting stitches to help me visualize where to quilt. To keep the cost reasonable I chose to free-hand fill the spaces right up to the seams instead of stitching in every ditch (though I did what was necessary to help control the quilt). 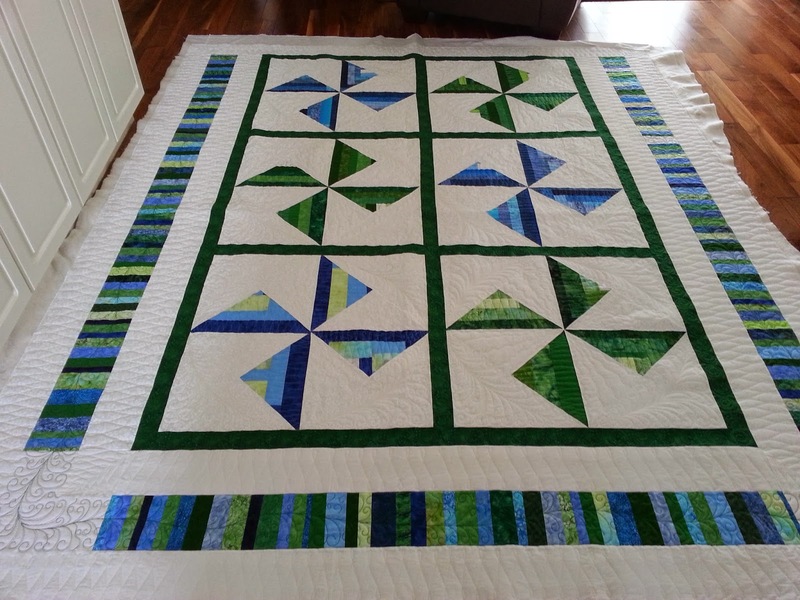 Fingers crossed that my client will be happy when she sees her quilt . . . !!! 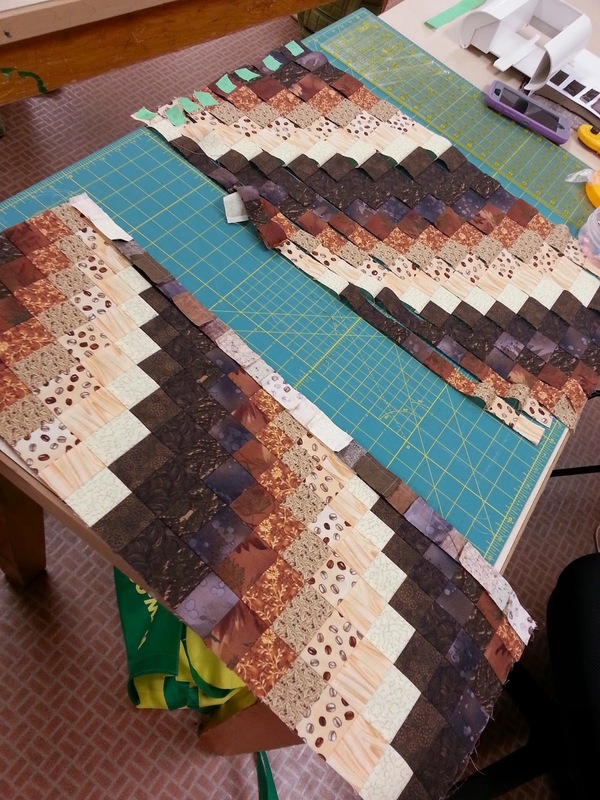 I love my crazy, quilty life!!! Tomorrow my beautiful daughter will help me get a decent "head shot" for my professional portfolio. Should only take about a million tries. I'm hoping we manage something that won't make me cringe, so fingers crossed for that, too! Ha! 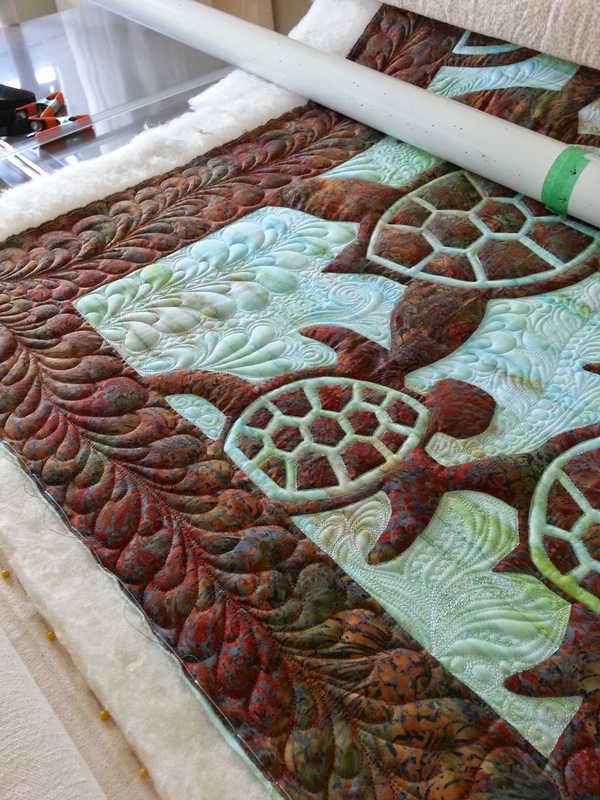 Quilt Canada is coming soooonnn!!! More excitement. P.P.S. Check out my sidebar to see where the parties are. There's something fun every day of the week!